As announced, I'm now going to sell some ULA replacement modules. I'm sorry to let you wait this long - but I used the time to drive the C5 and made some last minute improvements on the firmware. I noted that sometimes the reed sensor switches tend to keybouncing which results in false speed values. To resolve this problem with less complexity, I just defined a "maximum reliable speed" of 70km/h. I don't expect you will ever gain this speed (as long you're not driving the jet powered Sinclair C5). I thought I would be very annoying if you lose the magnet that triggers the reed switch because then the motor wouldn't be available any longer if the pedelec mode is active. So I added the option to add more than just one magnet - in case you lose one, speed value or pedal rpm value will be incorrect but motor support is still available. There are some more recent changes - i.e. I reduced flickering of the current indication LEDs. Although I'm still not 100% satisfied with the firmware and probably never ever will be, I think it's now time to sell the thing. I made 12 modules. One is for my own C5, one for further software development and one already sold. So there are 9 modules left which I'm now going to sell here. The price for a replacement module will be 40 EUR (£ 34.00) +5 EUR for shipping within the EU. What is the regulator for? -> During development the 5V regulator in my POD broke. I don't know if this is due to the replacement module or another reason. However, I replaced my old regulator with this stronger type and in case your regulator will also break, you then will have a replacement. Is there anything more I need which is not included? Yes, if you like to operate the C5 in pedelec mode you will need bicycle tacho sensors for the pedal cog and for one wheel. If you like to develop own firmware for the replacement module and upload it via the bootloader or if you want to edit configuration settings (i.e. to activate or to deactivate the pedelec mode) you will need a voltage converter to connect the replacement module with a computer. The price for one converter set will be 5 EUR (circa £ 4.20). Whether you want the replacement module operating in pedelec mode or not. The wheel circumference where you will attach the tacho reed sensor. The minimum speed required to enable the motor. This value applies only if the pedelec mode is active. 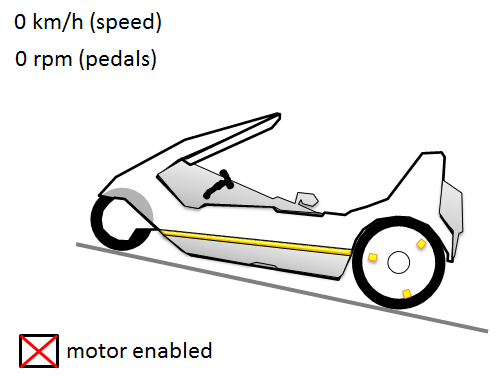 The maximum speed where the motor is enabled while the driver is pedalling. This value applies only if the pedelec mode is active. The fan activation temperature (default = 45°C). The number of magnets for the tacho reed sensor. The number of magnets for the pedal reed sensor. this setting by yourself. But as a service I will pre-program the module prior shipping with your desired settings. Payment can be done via paypal or giro transfer. You'll get detailed information via e-mail. All required information can be found on the ULA replacement project page. Can I take a chip and the pc connector please? Set up for a standard C5. please reserve one for me with the module thingy. will advise settings in another email later if thats ok. thanks. Hi have sent e mail re this. - and two other people who showed interest but didn't respond since then. John, Vanpeebles and Mike, I've send you an email. I think I have to clarify this pedelec mode the ULA replacement module offers. This is going to be a long story but please read this if you want a replacement module for your C5! On the other hand, the compensation for these constraints is, that you can drive the vehicle within the entire EU totally street legal and without further insurance, accreditation or the like. If set to "inactive" everything is in the same manner as hithero: push the button and just go. Nothing more to tell about that. Here is our C5. It is standing stopped on the road, in this example on a uphill street. In this situation the motor isn't available. 1. The driver isn't pedaling. 2. We configured a minimum speed of 6.0 km/h to enable the motor. This prevents to accelerate with motor power only since this would cause an extreme motor current and discharge the battery very fast. But of course, you are free to set the minimum required speed to 0 km/h. The only thing to start the motor would then be to pedal. In this example, you soon gain a speed of 16 km/h just by rolling downhill. But the motor is still not available. Because you are not pedaling. Moderate pedaling increases the speed to 18 km/h and now the motor is available! Yeah! Together with the motor you gain an incredible speed of 22 km/h and you feel like a jet pilot on a low-level flight! This makes you so crazy - you're going totally mad and give everything you have, accelerating up to insane 30 km/h!! You're so mad you even don't notice that the motor went off because you exceeded the configured maximum speed of 25.0 km/h. Now, how does the replacement module know how fast you are driving or pedaling? You need to add reed-switches to connect with the replacement module and magnets to trigger these switches. Oh! The switch was pressed! AGAIN! Let's see: it's been 500ms since this happend the last time. I know from the configuration settings that the wheel circumference is 1.28m. So you could say the current speed is 1.28m/0.5ms = 2.56 m/s. One hour has 3600 seconds. So the speed is 2.56 m/s * 3600 = 9216 m/h. Now I divide by 1000 to get 9.216 km/h TA-DA! Also add a reed switch to get the pedal revolutions to enable the replacement module to see if you are pedaling or not. It doesn't matter how fast you are pedaling. You can do this completely whishy-washy as long you are pedaling anyway. Now, what would happen, if you lose the magnet on the image above or the pedal switch magnet? You wouldn't be able to activate the motor because the replacement module either thinks the C5 is stopped or you are not pedaling. There are 4 magnets for the speed sensor. The replacement module calculates the speed as described above and then divides the value by 4. Now you lose one magnet. Constant actual speed given, less switch pulses are generated as before but the calculated speed value is still divided by 4 causing a false speed value lower than the actual speed. But as a matter of principle the motor is still available. There are 2 magnets for the pedal sensor and you lose one of them. The replacement module then calculates a wrong pedal rpm value. But since this value doesn't matter anyway (because it's only relevant whether you are pedaling or not) this has not further impact. I hope this answered some questions and that it wasn't too long/complex/boring/whatever. phil thats a really cool explanation. (wish i could do that stuff). i wasnt aware that pedalec mode means you have to constantly pedal. is it possible to put the pedal sensor on the back wheel too? that way you just pedal before the motor kicks in, thus allowing you to stop peddling once moving. that stops gearbox stress from standing starts. david. This is really good stuff chaps and makes the future of c5's long and bright - well done. is it possible to put the pedal sensor on the back wheel too? that way you just pedal before the motor kicks in, thus allowing you to stop peddling once moving. yes, although this wouldn't be a "legal definition" of a pedelec mode, to prevent the motor or gearbox from taking stress damage this would work. What I'm about to say is, that with the pedelec mode you indeed have to constantly pedal. But you can do this comfortable and very slowly without any effort. The timeout also allows a short pedaling pause to switch to another gear, if you build a gearshift into the C5. Update: now 2 Modules left for sale. i received mine today (thanks phil). it all looks highly well produced and designed and also came with some additional back up components (thats a sure sign of a quality piece of electronics). im in no rush to fit mine but im sure others will be fitting pretty soon. thanks again to phil. Chas, I just send you an email with payment details. @all: Since the module for gowrings c5 went to the post office on 27th Jan, the delivery to England seems to take much longer than I expected.